Today we have a guest blogger. 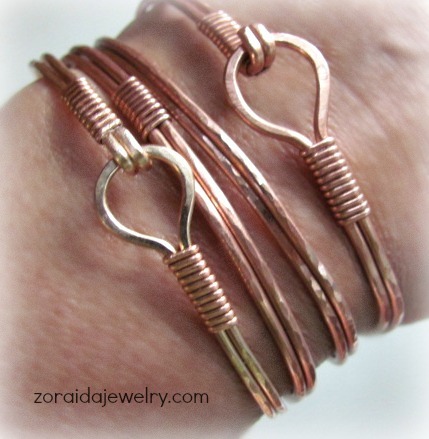 Please welcome Zoradia of www.artzjewelry.wordpress.com who is sharing a Bangle Bracelet Tutorial with us today. These narrow, stack-able bracelets are fun to make, comfortable to wear and look great in different metals. This basic design can be used on any metal you can manipulate as long as it is not brittle and is able to withstand the bending and hammering. They can be left bright and shiny, oxidized or colored with a patina. You can add more binding wires anywhere you like, dangle a bead or charm from the little loop or make the loop bigger. They can be worn with the clasp on top or bottom as well. They can be made to be worn snug like a cuff or loose like a bangle. You even change the shape from oval, like these, to round. I’m sure you can come up with even more variations. 16 gauge round, soft wire 15″ (small 6″ wrist) to about 19″ depending on wrist size and whether you want these oval or round. 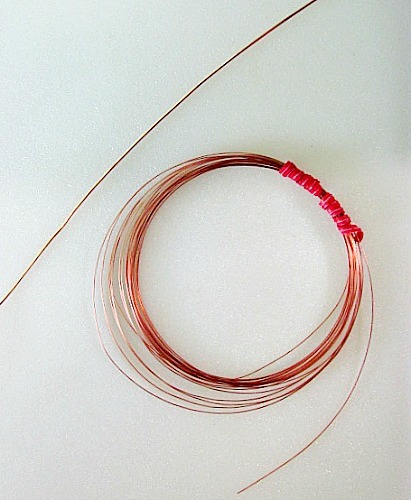 18 or 20 gauge half round wire for binding. The length depends on how much binding you’d like to have. Bracelet mandrel or other oval or rounded shaped solid object to form the shape. It should withstand some hammering. Chasing hammer or other type of small hammer for hardening and texture. Medium bail making pliers for creating a loop for the clasp. Size of loop is optional. 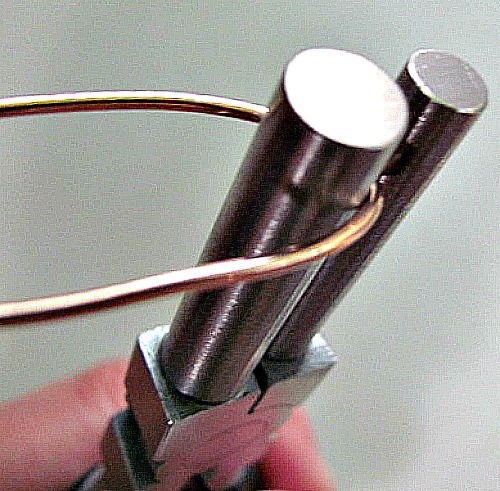 Using the bail pliers or similar object, fold the 16 gauge wire in half like this. Bring the two sides of wire close together. The flat nose wire is useful for this step. Align the ends of the wires by moving the bail pliers until the ends are about even. 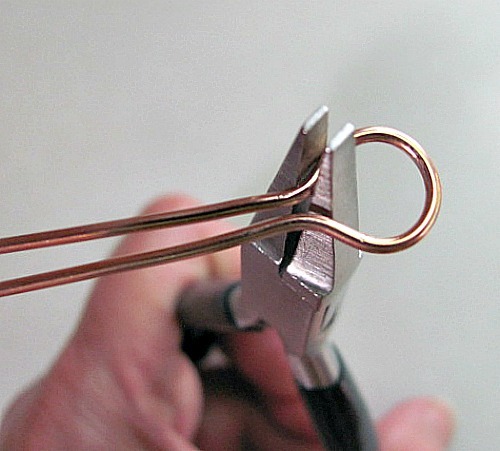 With the flat nose pliers, create a small dip on both sides of the loop. Make sure your loop is centered on both wires and they are still aligned. 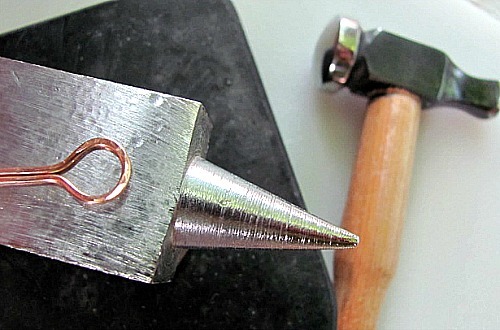 Place your wires on steel block or anvil and hammer to flatten and texture the loop clasp. Place you wires on the mandrel or other rounded or oval, solid object. Make sure to center the clasp by keeping it in place. Hammer all around the bracelet except - the last 3/4″ of the straight wires should be hammered only lightly. 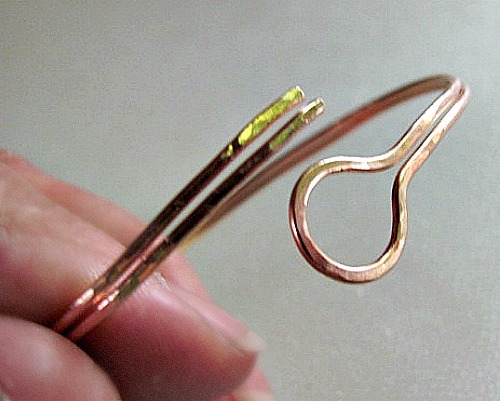 These will form the hook for the clasp and will bend more easily if left somewhat rounded. They can also be left completely rounded. Remove the bracelet from the mandrel. It should look oval or round with the clasp in the center. Bracelet off the mandrel. The ends are aligned. Cut a section – at least 6″ – of the 20 or 18 gauge, half round wire. 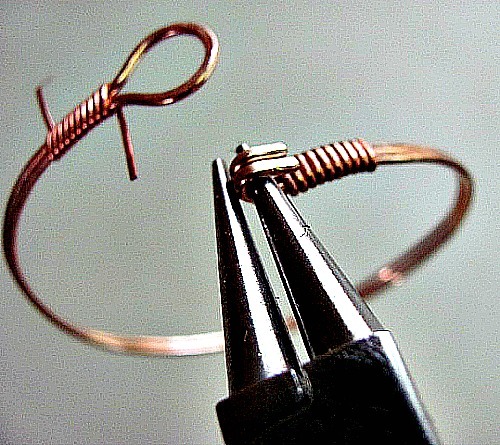 Make a small bend in the wire with the rounded part face up. 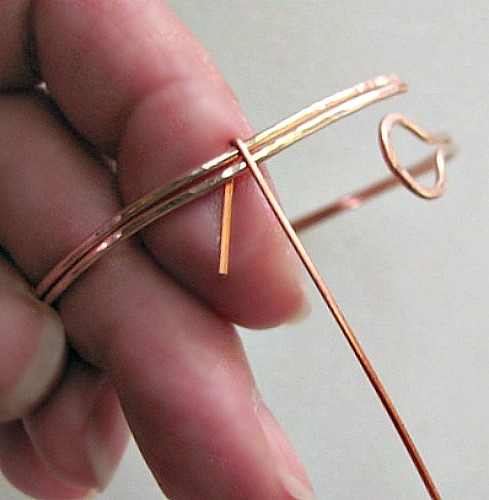 Place the flat part of the wire against the bracelet (straight wire end) leaving a tail to hold onto. Begin wrapping the wires together, keeping the wraps straight and close to each other. 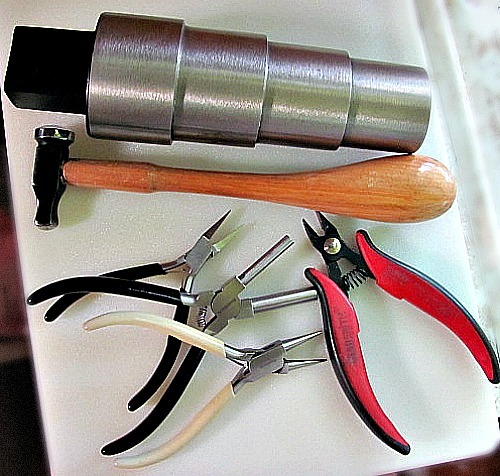 Gently press each round with your flat nose pliers to anchor them. 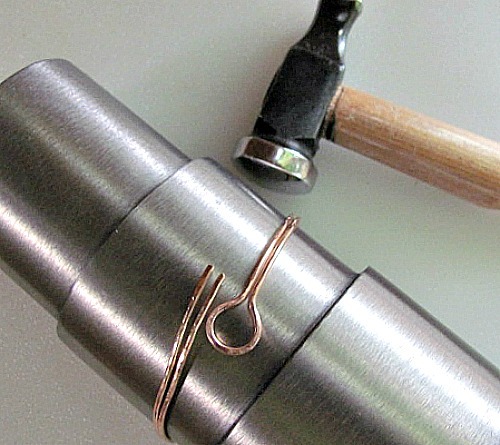 You can wrap as much as you like, but leave at least 3/4″ unwrapped for the hook. 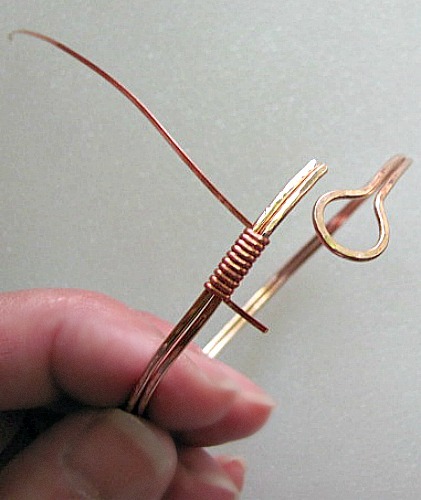 Hook the half round wire, flat side in leaving a tail to hold onto. I will later wrap that section of the tail up around the wires as well. Wrapped wire leaving 3/4″ unwrapped for hook. 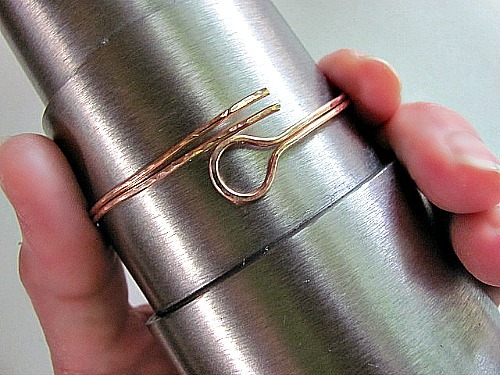 Wrap the wires on the other side of the bracelet as well in the same way. I find it easier to start at the end of the loop and work toward the center of the bracelet. With the round or flat nose pliers, create a small hook outwards by grasping both wires (hold the bracelet firmly so the wires stay aligned). This loop should be no bigger that 1/4″. You can make in face inward if you prefer. It works best when made into a “U” type shape so don’t make it circular. 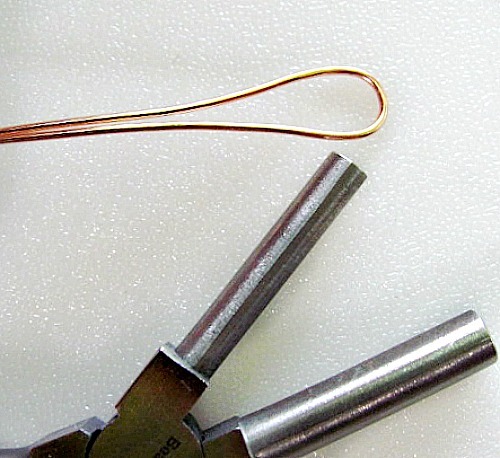 Trim the ends of the wrap wires on the inside of the bracelet and press flat with the flat nose pliers. Make sure nothing sharp is sticking out. 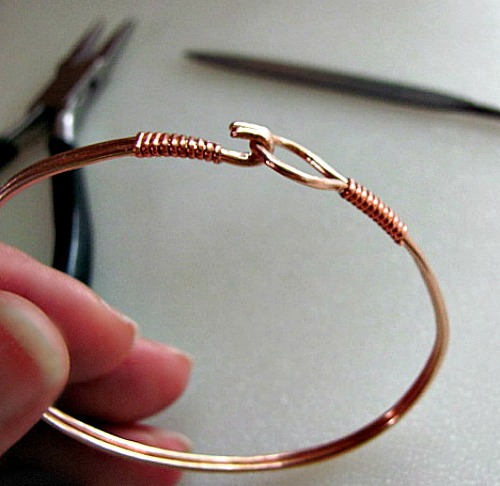 Move both ends of the bracelet slightly to bring the hook to the center of the “eye” loop. You would giggle this as you would when opening and closing a jump ring. Hooked clasp on bracelet to be filed smooth with needle file. File the ends to remove any burrs. If the become misaligned, place the bracelet back on the mandrel and adjust. Place the bracelet on the (smallest) side of your wrist by gently moving one side of it up and the other down. It will look a little out of shape. Not to worry, when you hook it, it will easily align again with very little effort. All done! Make several more bracelets and stack them on your wrists. These were left shiny with a protective sealant – ProtectaClear from Everbright Coatings. Stacked up bracelets, hook side under. It is easy to make this more oval, round or aligned by putting it back on the mandrel to shape. You can also use a rubber or rawhide mallet to harden it a little more if necessary.